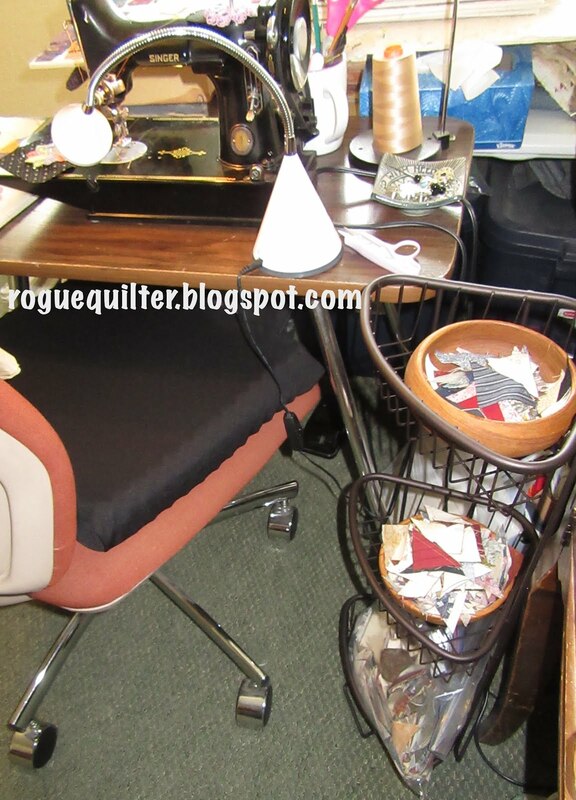 rogue quilter: May Mini, etc. I have been mostly absent from blogging for over 3 weeks. Thanks to those that checked in on me. I am still here, but between continued physical therapy, wedding plans (this Saturday!! ), gardening, and time spent helping Mom, there really hasn't been sewing time. This week I forced myself to finish a mini quilt for May. Just squeaking under the wire. Here we have "Uncle Kevin's Tree Farm", based on a pattern from Kevin The Quilter. I shrunk the block, of course. The top was made in December, so I only did the quilting in May. You can see from this back shot that I just did a bunch of straight line quilting. Down the road I may do some hand stitching in the sashing, but can't worry about that now. Wanted to share a handy item I picked up at a Ross store recently. This is a caddy for the bathroom. I set it beside my featherweight in my sewing room. 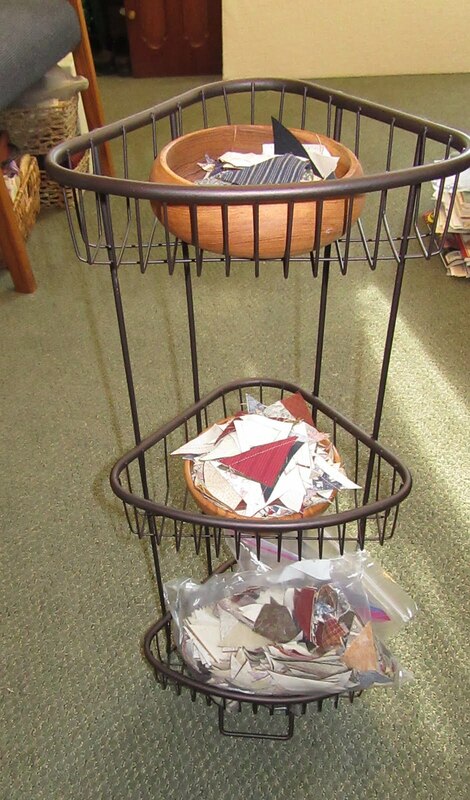 The bottom basket holds a bag full of bonus triangles from a couple of blog friends. I grab a handful of the triangles and put them in the bowl in the top basket to use as leader/enders. When I pull them from the machine I drop them into the bowl in the second basket. Keeps all the leader/ender parts organized and handy, without using my limited table space. The photo on the right, above, gives you a better look at the caddy. The barn quilt DD#2 made for me finally got put in its place on the shed. I love it there. Wish I had taken the photo before the lilacs started fading. They looked very pretty together. As I mentioned in my last post (so long ago you probably don't recall), May is my blog anniversary. It has been seven years! Hard to believe, sometimes, though it feels like I have always known some of my blogging buddies. To show my thanks to my followers and friends, someone will be chosen to receive this little bundle. 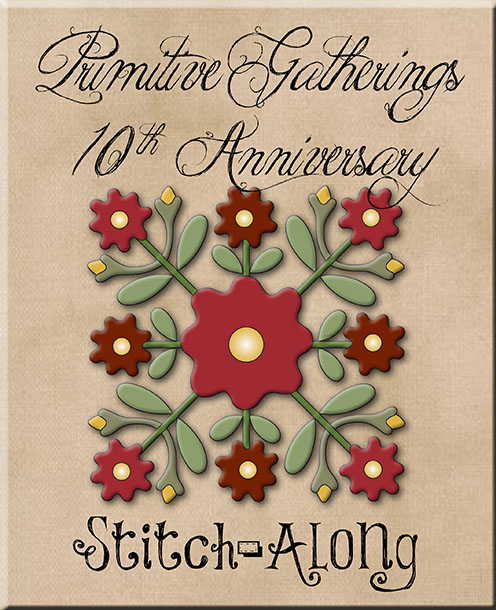 This includes Jo Morton's latest book of little quilts, four FQs of her new line of shirtings, one of my Dresden pincushions, and a Riley Blake measuring tape. I will throw in some of my soap, too. Leave a comment if you are interested. Thanks to all for the years of sharing and friendship! You are the best! You know I love your Blog!! Hope the wedding plans go well. Did you find an outfit?? Under the wire works. Always enjoy reading your post. Love to see all the quilty goodness. You have certainly been busy, but not always in your sewing room? Hope the physiotherapy is doing its job. Love the Christmas tree mini. Your barn quilt is beautiful...I have one on my to do list for my shed too...yours inspires me! Have a wonderful wedding and congrats on your blog anniversary! I just wanted to say hello...no need to put me in the draw. Love your fabric caddy idea! I've been following your blog for quite awhile in a reader; I love seeing your minis with your precise stitching. I recently looked for shirtings at my LQS and found only 1--they are perfect for certain quilts. I've just begun to hand piece and would like to hand piece some miniature quilts. Thank you for the giveaway and congratulations . Love your blog...your little tree quilt is just beautiful..thanks for all the inspiration! Your miniatures inspire me to make some of my own. Please keep up the blogging because I enjoy seeing your creations. Love the new sorting system for L/E! That stand is perfect and easy to move if in the way. The tree farm mini is so cute and will be ready for winter:) Congrats on the anniversary and enjoy the wedding if you can. Love your blog! The tree quilt is very nice! Hi! Good to see you and i love the little Christmas Tree mini. What a cute holiday quilt. The barn quilt looks wonderful on your shed and what a awesome shed!! Clever use of the little shelf for sewing needs! Have a wonderful weekend with the Wedding!! Your mini of May is very cute and I'm sure Kevin will love it too ! I wish you a wonderful wedding weekend and thank you for the giveaway (if it works for internationals)...Happy anniversary ! I have enjoyed you blog. Love seeing your minis. The tree farm will be a beautiful display in December. Has it been 7 years? Time flies when your reading is fun! Congrats on your lucky 7 bloggiversary! Love the quick Christmas finish, especially that plaid binding. It adds just the right touch. Many blessings to the bride and groom, and I hope the day is perfect. I enjoy following your blog and seeing all your minis. The tree farm is perfect for the holidays. Congrats on 7 years of blogging. The bathroom caddy is a great idea!!! It was nice to get caught up what you've been doing. First, your May mini is lovely. Perfect for the holidays. Your so good about using your featherweight and having a leader and ender project. I've got to get a new one started. But mostly enjoy the wedding! love your May mini quilt! I always enjoy seeing what you're up to. CONGRATULATIONS ON 7 YEARS OF BLOGGING I LOVE YOUR MINI QUILTS, I THINK IAM GOING TO HAVE TO START MAKING MINI'S AS RUNNING OUT ROOM / AND FRIENDS TO GIFT QUILTS TO. BUT I STILL WANT TO MAKE QUILTS PLUS REALLY NEED TO USE UO THAT STASH. Hey Janet! I had been wondering what you were up to! The tree farm quilt is adorable and your quilt block is pretty on your little barn. I'm currently painting my second barn quilt to hang on my fence outside my kitchen window. I'll post pics when it's all done. I like your organization caddy by your sewing machine. Our minds are always thinking of these things, aren't they? I've been big stitch quilting on the quilt top from my last blog post; otherwise, nothing new going on in my world. Happy Blogversary.... that's a sweet give away that any of us would love to win!!! How's that shoulder? Congratulations on 7 years of blogging! I enjoy how you always "miniaturize" all the blocks and quilts. I guess you can't help it. lol The three tiered basket is a clever idea for handling leader-enders. Thanks for the idea. It would be so exciting to win! Love your blog! Love the caddy--great for keeping organized in small space. And what a generous giveaway--thanks for the chance to win! Been missing reading your blog these past few weeks - good to see you back. Sometimes life just exceeds! Very nice give-away - would live to win this! Love your blog. Always inspiring. Giveaway looks wonderful. Your little tree farm is adorable! I don't always comment, but I look forward to all of your sweet little quilts. Congrats on seven years of fun! Congrats on your blog anniversary! I love seeing your mini quilts! I think about blogging but I just can’t seem to vote on a format.....i thoroughly enjoy when your newest one shows up. It often gets me to get back to doing some “me” time. And I usually like the project you are working on. I like to resize and tweak other designers work too. May has been a busy month for you! The little tree quilt is adorable. Happy blogaversary! Of course, I'd love to win the goodies! Your tree quilt is so cute, will be a great addition to the holiday. Love your barn quilt. I am always inspired by you and your beautiful quilts!! The mini quilt turned out so cute! Love the barn quilt. Congratulations on 7 years, and I plan to enjoy many more!! Of course I'm interested--lol! 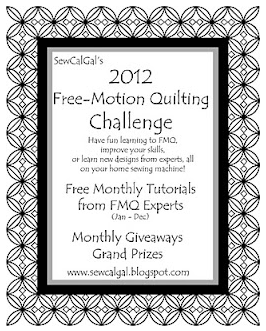 I so look forward to your blog posts and seeing your sweet little quilts (as well as all the great tips!). I hope the wedding is wonderful and you have an awesome day--so exciting!! Your table-side caddy for your leader/ender projects is perfect, especially its portability. Love your barn quilt too! Happy 7 years, and I hope you continue sharing all your mini creations with us for years to come. May the wedding couple be blessed with a beautiful day and a long and happy, loving life together. Seven years! Congratulations. Of course I'd love to win. The caddy is great, bt I am mystified by leaders and enders---I don 't want scrunched up knotty seams on my intended L & E quilt top either. And I find it confusing to work on 2 quilts at once? So I gave up that idea. Congratulations on your blog anniversary! I love the basket find, I'll be watching for something similar. My sewing table becomes so cluttered I lose track of leader-ender pieces, but this would be perfect. Hope the wedding weather is perfect. Another adorable mini! Best wishes for a wonderful wedding day! I was thinking of you and hoped it was life and not health that kept you busy. Like you, i love to "make it smaller". Thanks for the give away opportunity. Love your little tree quilt!! What a great idea using the caddy next to your machine. Your tree farm quilt finished beautifully! I need to get working on mine. I forgot all about it, so thanks for the reminder! What a clever use of the bathroom caddy. Happy blog anniversary and thanks for a wonderful giveaway. Happy blog birthday! Your mini tree farm is so cute and I love the simple straight line quilting on it. Good luck with the wedding weather, too. Wow, congrats on 7 years. I love your minis- I do them too but I think you get more done than I do. My son got martied in October. I got some good advice that I want to pass on to you. Relax and enjoy the day as well as wear comfortable shoes! Happy 7th Blogiversary! So many things to love about this post! I love the fact you titled your little quilt "Uncle Kevin's Tree Farm!" I call myself that to a lot of people....other than Kevin the Quilter LOL Also, the straight line quilting is perfect for the quilt....and I love straight line quilting! Your barn quilt is charmingly beautiful! If anyone knows about life taking precedence over blogging, it's me! We love hearing from you no matter how often! Time flys when your having fun! Congratulations on seven years of blogging, thank you for sharing your beautiful work, I have enjoyed seeing and learning from you, re our mutual love of minis. Hope the weather is perfect for the happy couples special day, enjoy! Happy Anniversary! Long time follower. Love your blog and quilts. Congratulations on your anniversary! I really like your Tree Farm Quilt. I enjoy your blog and thanks for the opportunity to win! I have been wondering how you were doing since you had been absent from Blogland. How creative to use that bathroom rack for a sewing purpose. I haven't been in a Ross store in a couple years and there is one very close by. In the midst of all you are doing, you think of us, your fans...how thoughtful. The little tree quilt is charming and I am gathering fabric as we speak! Thank you! Take good care and enjoy as your memory-filled days arrive. Love to read about your quilting progress. Thanks for the giveaway. Wow, 7 years, congratulations. Love the bathroom caddy that you're using for your leaders & enders, it would never have occurred to me to use it for them. Like most of the little quilts that you make the little tree quilt is a beauty. I've got my fingers crossed for the giveaway. Congratulations on the upcoming nuptials!! Glad that you're feeling better, Janet!! Love reading your blog. Your Uncle Kevin's Tree Farm trees are seeeew cute,the "Oh Christmas Tree" quilt came out great may have to make one myself. The Jo Morton give away is awsome!!! Happy seven years & many,many more. Have a great week-end. Your mini quilt is adorable, as always! That shower caddy is ingenious! I may need to get one myself. I would love to win your giveaway bundle. Thanks for the opportunity. Love the darling mini tree farm quilt. How much smaller did you make your block? How exciting ~ getting married! Best of luck. Happy Blog anniversary. I LOVE Jo Morton ~ fingers crossed! Cute Christmas tree wall hanging!! Congratulations on your 7th anniversary and thank you for always taking the time to share your beautiful works of art in miniature format, I love your work!!! Enjoy the wedding and Blessings to you and your family! I hope everything goes smoothly for your son's wedding tomorrow -- no rain, not to hot, etc., etc. Your little tree quilt is too fun and the quilt your daughter made for your shed it precious. I really like the block she chose. Your caddy is a great idea, Janet. I really must begin using leaders/enders again. Love the tree quilt.It sounds like you have been very busy. Congratulations on your blog anniversary. I love the pincushion. It is really cute! have fun at the wedding. Your tree quilt is so cute. Little IS better!! Sounds like your life is full and busy right now. Sweet of you to take time to do a give away for your blogaversary. I've loved every post you have done. Happy Anniversary! I enjoy seeing all of your little quilts. Thanks for the idea for the leaders/enders. I use that technique but sometimes spend too much time sewing them. Maybe this would get them off my sewing area so I could concentrate on my real project. Hi Janet - I love reading your blog. Full of inspiration !!! Hope the wedding went well. And please tell me how you do your triangle label on your quilt ?? I love that idea !!! Janet we are walking the same path in life right now-- minus the gardening for me! Love your projects-- keep stitching when you can. Thanks for the chance to win the neat bundle! Enjoy the wedding!! I’ve enjoyed your blog so much over the years. Thanks for sharing your beautiful quilts. Happy wedding day too! 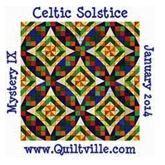 Thanks for sharing your quilts on your blog. You are an inspiration. I really enjoy the quilt blogs and do appreciate the time and effort you ladies put into them. Happy Anniversary on your success! Happy Blog Anniversary and wishing your family a joyous Wedding! I so love the inspiration from your blog. Happy Anniversary! I really enjoy seeing what you are working on and I hope that you will continue to inspire us with your beautiful quilts. Happy Blogiversary! I always enjoy your updates and am amazed by your productivity. Happy Anniversary! Yes indeed.....time goes quickly! But, I think that's a sure sign of happily keeping busy! :-) I love your system with the bathroom organizer! Perfection! Kevin's Tree Farm looks like fun! I may have to try and stitch one up by Christmas... ;-) Thank you for all of your inspiration, tips & tricks! have to make that for Christmas - still plenty time so I just might get it done.. Thank you for all your wonderful ideas and inspiration..Have a great day..
Glad to have you back! And Happy Happy Blog-a-versary! Love the tiny trees, and barn quilt! I would be SO happy to win that nice little bundle you are offering. I’m so happy that I’ve found your blog. I enjoy reading all of your postings and admire your work so much. Hope the wedding was perfect, and that your PT is going smoothly. Maybe you’ll have a little more opportunity for quilting soon! Happy Anniversary - love to check in and see what you are working on. So very cute! I love the tree quilt, I love all things trees. And I think your barn quilt is adorable. Thanks for sharing. I always look forward to reading your blog! Happy Anniversary! Seven years is a long time for sure. Thanks for a chance to win. Glad to see you "back in the saddle". I missed your inspiration. Love the little mini of the Christmas trees. Congrats on the blogiversary! I have enjoyed reading your blog for quite some time now - I'm always amazed at how much you accomplish! Your mini quilts inspire me to try new things...thanks for sharing your talents with all of us. Wow Janet, am I behind on my blog reading! I just noticed your May mini and I love it! I will link as soon as I get a post up. Where did May go???? I just found your blog. It is delightful. I love the mini tree quilt. I've yet to try a true mini and this is great inspiration. I'd love to have a quilt sign over my garage of my house. My neighbors might think I'm a bit odd, but I don't care. I don't think any of them understand about quilts. I live on a cul-de-sac. The giveaway is phenomenal. Good luck on feeling much better. I love making small/mini quilts and I am always inspired by your creations. Thanks for blogging and sharing. I had to zoom in your FW, I have one as well! Thanks for the tip on the caddy. Your quilts are always amazing, such great color choices. Hope your feeling better and the wedding went well. Thanks for a chance at a great give away. What a great sewing caddy! The tree mini is cute, will have to make one, there's time until Christmas! Happy anniversary !